Wow...I think this week is n e v e r going to end! It has dragged on and I am beyond exhausted. My cold is on the mend, but still not completely gone and I haven't quite been able to get it together this week. I feel like I have been spread so thin lately and am ready for the beginning of school craziness to settle down. Last night, however, Bryce was out of town and I had the night to myself. It did wonders. I had a hair appointment right after school (where my sweet hair dresser gave my hair some extra glam curls to make me feel better! ), followed by barre, and then a free evening. 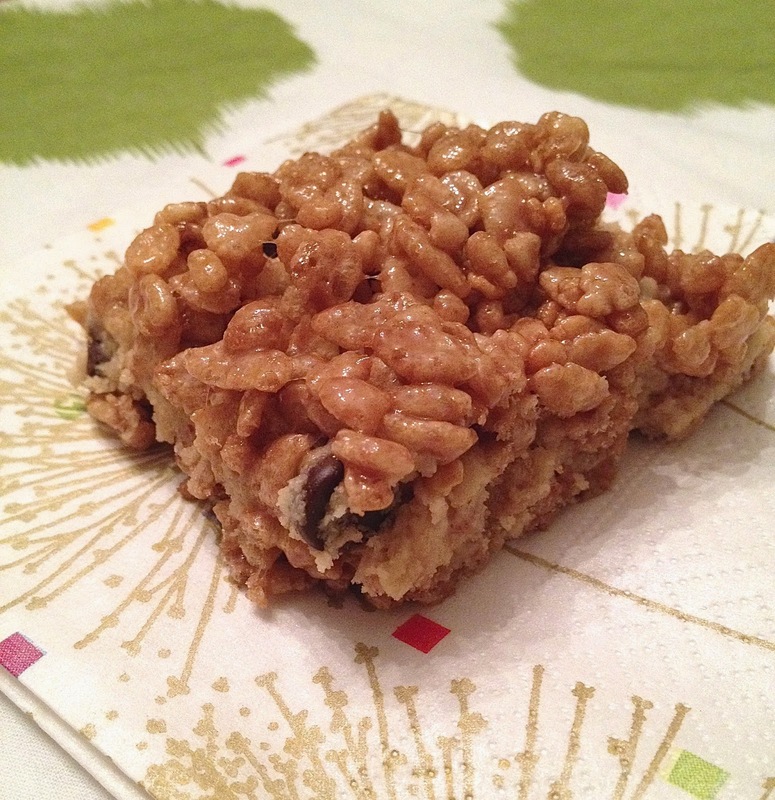 I decided to use my free evening to make a new favorite recipe I've been craving: Cookie Dough Rice Krispie treats. I blasted Taylor Swift's "Shake It Off", among other tunes, and had a dance party-baking sesh! By the end of the night I had forgotten how exhausted I was and the fact that I had a cold. It really was, just what the doctor ordered! Cookie dough is pretty much one of my all time favorite things and rice krispie treats are another favorite. Put them together and you've got heaven on earth. The recipe was found in this book that I received as a birthday present last year. You will see my slightly modified version below. 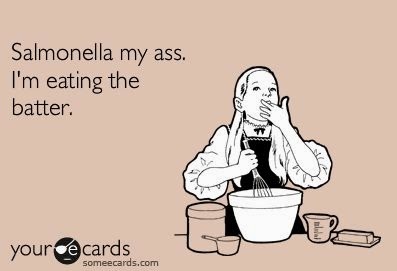 *I typically double this and have a little dough leftover! -Beat together butter and sugars with electric mixer on medium speed, 2-3 min. -Add vanilla and milk and mix in by hand with a spoon. -Mix in flour and salt and beat on low speed until incorporated. -Grease a 13x9 in baking dish with butter or cooking spray (I also like to spray my rubber spatula with cooking spray, as it will make stirring easier). -Melt butter and marshmallows in large saucepan over low heat, stirring occasionally, until melted. -Press half of the rice krispie mixture into baking dish. -Spread cookie dough on top. -Top with remaining rice krispie mixture. If you're like me, you won't have any self control with these heavenly treats, so you'll have to find a way to get rid of them before eating the whole dish. 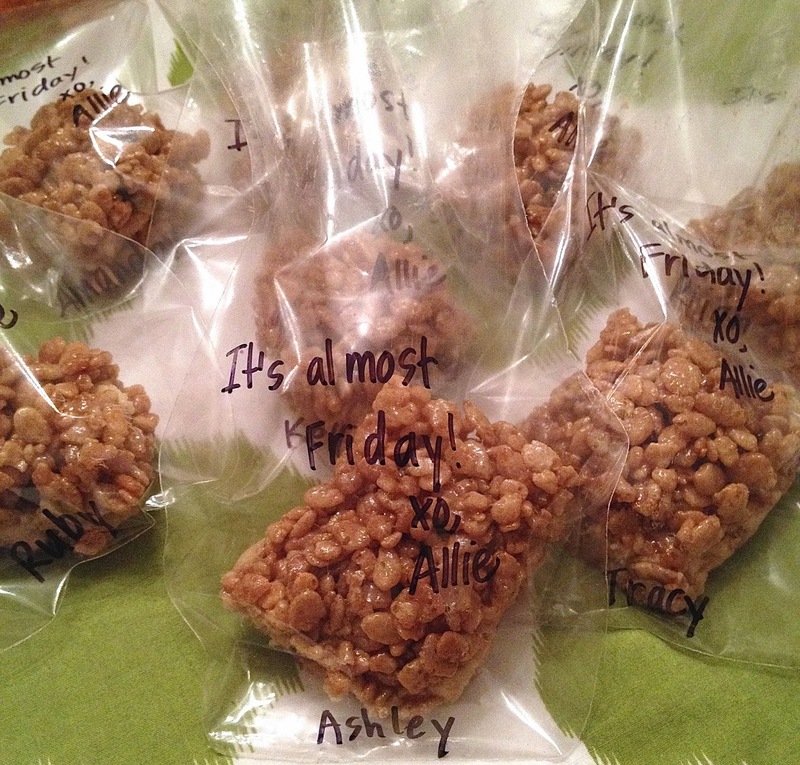 I decided that I would take them to school and share with some of my fave fellow teachers. It's been a long week and I'm hoping these treats will provide a much needed pick-me-up for us! Confession: I may or may not have had to pare the rice krispie recipe down and made it in a 9x9 pan, because I had eaten so much of the dough before putting it together! 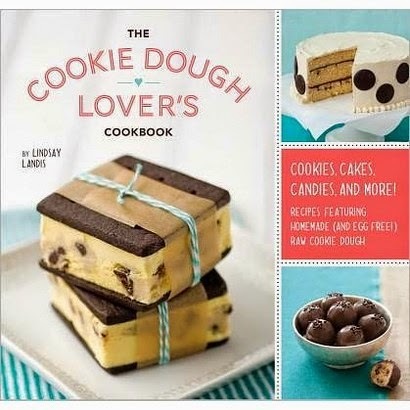 Are you a fan of cookie dough? Looks delicious! Glad you're feeling better! Sometimes a total girly night is just what the doctor ordered! good lord woman! these look amazing! and yes to that e-card. EVERY time. Some ladies are very lucky to get those goodie bags. Holy dessert of the century! Those look unbelievably tasty! I will have to try them! Sounds like you had a relaxing night with some me time. Hope you're feeling better! I have to make these this week!! Genius combo! My boys will loooove it.